Heinz Baked Beans in Tomato Sauce are one of the best-loved food products in the world. Packaged in that iconic tin, they are instantly recognisable as the original and best. The beans are full of fibre, as well as being virtually fat free and low in sugar and salt – so they offer a healthy, delicious option that is quick and easy to prepare. Heinz Baked Beans in Tomato Sauce are great with toast, as part of a good old-fashioned British fry-up, as an ingredient in numerous recipes, or when simply heated up and eaten on their own. 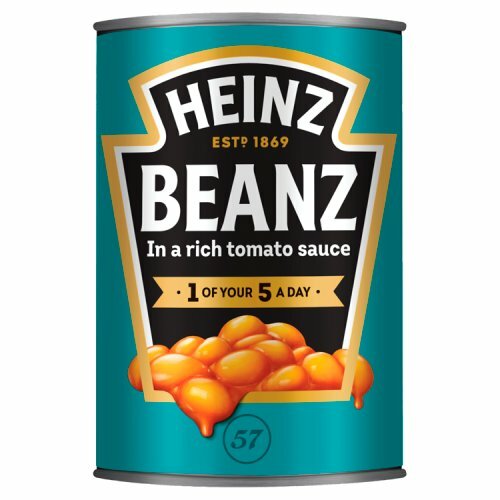 Most popular with customers in France, Italy, United States of America (USA), Canada, Germany, Spain, Denmark, Greece and Japan, but you can buy Heinz Baked Beans in Tomato Sauce for delivery worldwide. Beans (51%), Tomatoes (34%), Water, Sugar, Spirit Vinegar, Modified Cornflour, Salt, Spice Extracts, Herb Extract. Low Fat, Low in sugar, Suitable for Vegetarians. You can't beat Heinz baked beans I keep a stock of them. Beans on toast is a classic comfort food. The baked beans you buy in the USA are nowhere near the same, they are in bbq sauce, have pork fat pieces or hotdogs ugh. They think we're nuts to put beans on toast oh well, if only they knew what they were missing! Heinz beans are great, we have them here in Germany but for some reason they are cheaper to buy from here then going to my local shop! I find that very odd. We love having them with eggs and toast. Well worth stocking up with we do an order. Nothing wrong with some good old beans. Great for vegetarians, nothing beats beans on toasts for a late evening snack and Heinz are head and shoulders above everyone else. Highly recommended! Heinz beans have a taste that no other beans can replicate. They have the best flavour and they go with so many things. Jacket potatoes, fry-ups, beans on toast etc. They are a family favourite in my family. Everyone in Britain secretly loves Heinz beans. They go perfectly with the full Scottish breakfast. On toast. In a baked potato. And for anyone like myself, who has celiac, is very grateful they are gluten free. And I find they make a quick easy dinner, along with baked potato and some cheddar cheese. I'ts been years since I have had beans from England for breakfast so thank you for a great corner store on line. 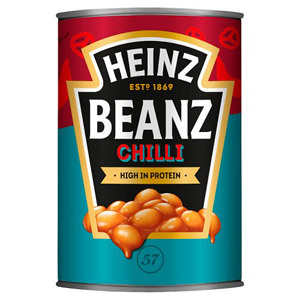 I'ts just one item among many that I will enjoy from now on.beans means Heinz was the ad I remember as a kid, Beans on toast, is a favorite of mine. Nothing beats the original. These baked beans are my MUST HAVE, an ideal quick meal for when I don't want to cook. A perfect breakfast with bacon and eggs.. A feelgood warming product with just the right amount of spice to be tasty.. And always good quality for money. My favourite ? Toast with a little Marmite covered with warm baked beans... a little side salad and yoghurt and you have a perfect meal ! They're the best baked beans on the marked or at least they are in my opinion. Heinz beans are iconic, versatile and, well, the best! These are a mainstay for us when we need a nice dose of home. My husband adds Worcestershire sauce to give them a bit of a kick. They are the penultimate survival kit away from the UK! There are many tins of beans in this world but there is only ONE tin of Heinz Baked Beans. Although these beans are available in the USA the average cost from a local shop, if you can find one, is $3.29. I also bought the Heinz baked beans in Canada which from the outside look the same, cost about $1.99 CDN, the tomato sauce is different, much thinner and more watery. Having been in the USA for 20 years I can finally order as many as I want. My family used to bring these with them but they are very heavy to carry. I only wished you stocked the Heinz beans with sausages! I think Heinz baked beans are one of the tastiest baked beans you can get in your country. They are really good, full of tomato flavour, salty just right. I am so looking forward to making my first jacket potato here at home with these baked beans which I will be ordering from British Corner Shop. Thank you for having the best of British food! This is the taste I've missed for years. So glad I can have them shipped over here now. I could easily fill the whole big shipping box with Heinz baked beans alone. I am also delighted they are certified gluten free, which is really important for those of us with coeliac disease. You can't beat Heinz baked beans! Nothing tastes the same and it sure does make my day! Here's another case of something not tasting quite as nice as its British equivalent. Lots of tinned lentils in France, but nothing beats the recipe used by Heinz in their baked bean product. I think it's the flavour of the tomato sauce that just makes this perfect for a quick meal. Heinz Baked Beans are the God of all beans! I have tried many different brands and cannot find one that compares to Heinz. The tomato sauce is so tasty and I always mop up every last bit of it with a slice of toast. My son is also a baked bean snob and will only eat Heinz! Rich tomato sauce that's neither too sweet nor too salty. Lack of bean availability is really one of the biggest regrets I have regarding leaving the UK. Beans will last for ages if stored properly, and are always a great option for those days when work gets too much, or you're poorly and can't be bothered cooking. A huge part of British food culture, they're great on buttered toast, a fluffy baked potato, rice, or just on their own. The beans are tender and mild, full of protein and a cheap way to fill up with relatively good food. Heinz is definitely my favourite for baked beans. With a couple of slices of toast, they make a fantastic meal. No fuss, no mess, just heat them up at eat. I just ate them for lunch with chips and an egg - delicious! After living abroad for so long, I am glad I can have them delivered to my front door. You really just cant beat Heinz baked beans. Tasty on toast or as a side with sausages or even as a topping on a jacket potato. Get ordering these as you will love them once you have tried them. These are lovely for children as a side or for lunch. I received my parcel from the British Corner Shop a few days ago and just to open it and see the Heinz Baked Beans brought a big smile to my face. I live in France; they sell baked beans here but the French ones are so bland, not enough tomato flavour. You can't beat Heinz for getting the tomato flavour just right. My mother always bought Heinz Baked Beans, a good wholesome meal with all the vitamins and minerals you need plus all the taste of home too. What else could you want? Can't beat Heinz beans! We add an Oxo cube to make the sauce thicker. A firm favourite in any British household and they have an ever increasing popularity. 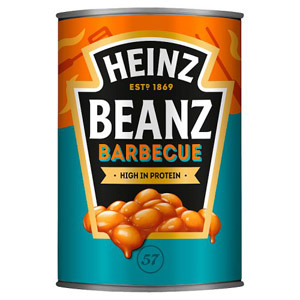 I have tried many different brand names when it comes to beans but always end up returning to Heinz. A quality brand with quality products. Snap top lid allows for easy access in order to compliment fish fingers and chips. I do like Heinz baked beans and up until a few months ago they were my favourite. The beans themselves are firm and not too large, the tomato sauce pleasant tasting. I will not mention which are actually my favourites at present because they are not available at BCS. Heinz are good value for money and always an economical, filling meal. Heinz Baked Beans are cheap, versatile, healthy, tasty and ready to use. What more could you want from tinned food? They contain a lot of very rich tomato sauce, with a distinctively Heinz flavour similar to their soup range. The texture is softer than other brands. Some other beans tend to be chewy or dry but Heinz beans are always perfect, with a creamy rich sauce. 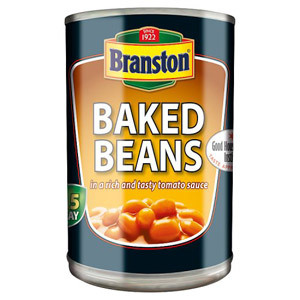 A rich tomato sauce and plenty of beans in a tin mean that these are perfect for proper "beans on toast". It's a well-known brand and I will not stoop to lower priced products as they just don't match up to the quality. A delicious snack or part of a meal. Probably the most well known of all the Baked Beans and for a very good reason. 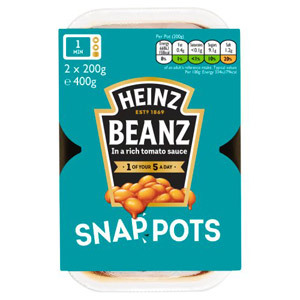 Heinz has perfected the recipe for their beans and produce a very healthy tasty, low calorie food ideal for adults or for children. Don't be fooled by inferior brands, Heinz are the best by miles. This is the best thing about British food! Heinz are the best brand on the market, with a rich and flavourful tomato sauce. You can use them in a multitude of dishes and snacks such as beans on toast, fry ups, cowboy pies, cassoulets etc. To mix things up, try adding a dash or worcester sauce or brown sauce. Like Maria and Peter, I think there is nothing like Heinz baked beans (except maybe now Branston's too). Spiced up or on their own with toast, or with chopped up mushrooms and cherry tomatoes and an onion mixed through, they are versatile and delicious and we just dont have anything like them here in the South of France. Nothing at all! 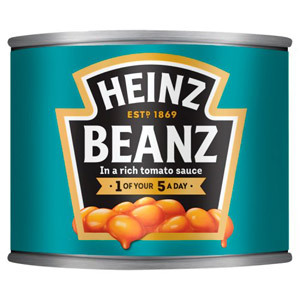 After twenty years of living abroad, the item I still miss the most is Heinz Baked Beans. They are so versatile - on toast, with eggs, for breakfast, lunch or tea. Try adding a dash of BBQ sauce and eat them with a barbeque. The kids love them and they are healthy too! You can't beat Heinz beans, none of the others taste the same. My full English breakfast is not complete without the original and best Heinz baked beans. Would you like to write a review for Heinz Baked Beans in Tomato Sauce?